Over the last 12 years, the number of startups founded has grown each year by 25%, according to Crunchbase data. That’s quite an acceleration each year! See the chart here. As the number of companies in a sector grows, do the odds of successfully raising capital decrease? 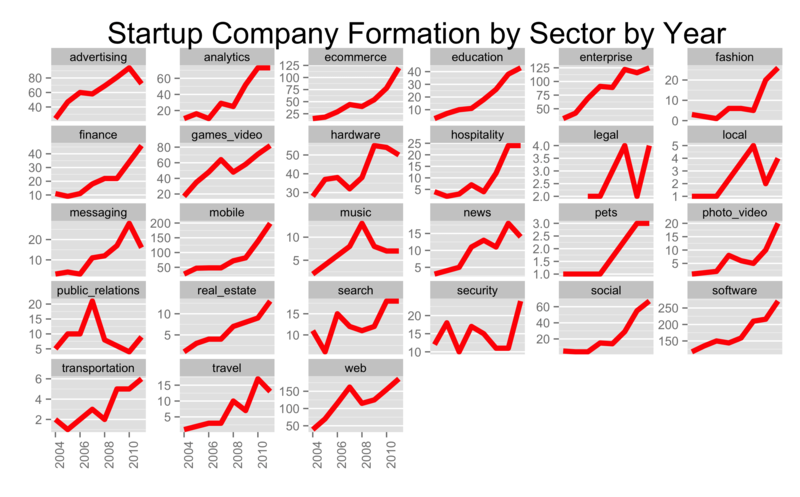 The chart above shows startup company formation rates, the number of new companies formed each year from 2004-2011 by Crunchbase sector. I didn’t graph the 2012 or 2013 data because the Crunchbase team told me the data sets need about 2 years to mature. Most of the categories are up and to the right. Advertising, hardware, messaging, music and PR are the notable exceptions with substantial decreases. On the whole, then, startups are competing with more and more other startups to raise capital. 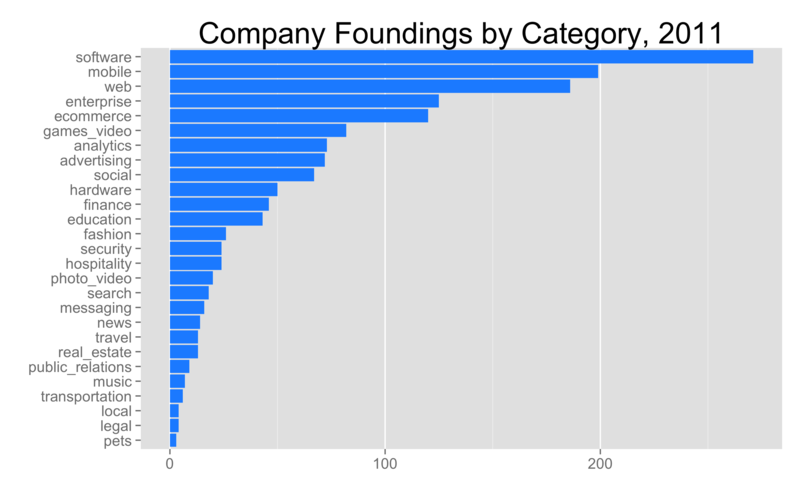 Below is a chart of the most competitive categories in 2011, those with the greatest rates of company formation. The first four tags: web, mobile, enterprise, and software are catchall. Then on down the list. Given this trend in 2011, and analogous trends in the ten years of the data set, we can evaluate the changes in ability to fundraise as the number of startups in a category increases. 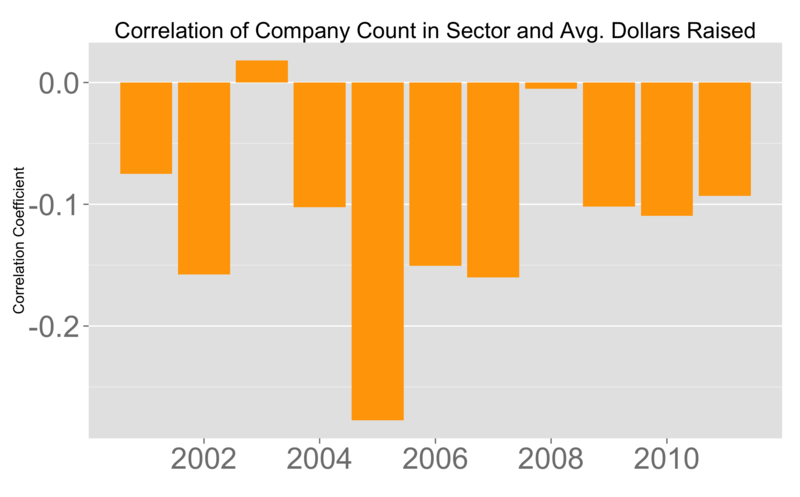 This last chart shows the correlation between the rate of company formation and the average dollars raised per company. On the whole, the relationship between the number of new companies founded in a sector in a year and the startup cohort’s ability to raise money is very weak, an average R^2 of -.11. So we can explain about 10% of the variance of dollars raised per startup through increased competition - not very much at all. In aggregate, the effect of competition doesn’t seem to be meaningful. At a micro-level, it could be that while several companies in a sector do compete for investment, they also each create awareness and excitement about the category which overall keeps the dollars raised per startup relatively equally. Though this is just speculation. In any case, these data don’t show any meaningful relationship between number of entrants in a category and fundraising success. The corollary to this analysis might be a startup’s biggest challenge isn’t its competition, but finding a way to grow scalably.